CROCKETT – A Crockett man is behind bars after he was booked into custody on two first degree felony charges and one third degree felony charge. 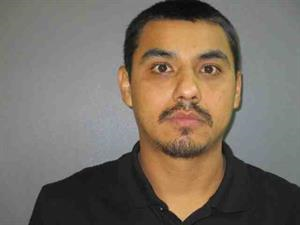 Juan Carlos Perez, 32, was arrested at his place of employment on Wednesday evening, Feb. 6 and charged with: one count of aggravated sexual assault; one count of aggravated kidnapping; and one count of assault by impeding breath or circulation. The victim, identified as a 31-year-old male residing in Crockett, reported he was attacked at his residence in the 1300 block of E. Goliad Ave. during the early morning hours of Feb. 6. Following the assault, Perez would not allow the victim to leave the residence or to use his cell phone, Smith stated. “The suspect then ordered the victim to lay down in the bed with him where he held him at knife point for several hours until the victim finally convinced the suspect to allow him to leave for work. Once the victim arrived at work, he contacted the Crockett Police Department to report the assault,” Smith reported. “This was not a random act of violence, the victim knew the identity of the suspect as they reside in the same house with multiple other roommates,” the police chief stated. After the victim identified Perez as his attacker, Crockett police officers went to Perez’ place of employment and arrested him. Perez was booked into custody and charged aggravated sexual assault and aggravated kidnapping, both first degree felonies. He was also charged with assault of a family member or a member of a household by impeding breath or circulation, a third degree felony. A third degree felony is punishable by a sentence of between two and 10 years, along with a fine of up to $10,000. Smith also expressed the Crockett Police Department’s sincere appreciation to the Houston County District Attorney’s Office for assistance provided during the course of the investigation.